All transactions are safe and secure with a reliable history in online purchasing behind each of our associates. Buy the Ghostbusters Action Figures, Ecto-1 Car, Slimer Toy, Stay Puft Figure to own Ghostbusters clothing and merchandise. 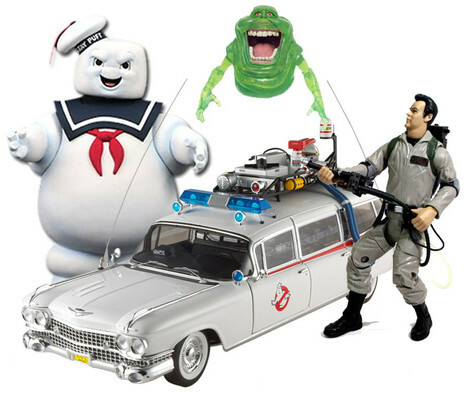 If you were a kid during the 1980s, you probably remember playing with Ghostbusters toy figures, including the classic Stay Puft Marshmallow Man action figure and Ecto-1 toy car. Today, fans and collectors alike seek out these vintage relics both as a way to celebrate the legacy of the original movies and as a way to temper their anticipation for the upcoming third installment. Get your hands on new and vintage Ghostbusters figures while you still can. In addition to the Ghostbusters Action Figures, Ecto-1 Car, Slimer Toy, Stay Puft Figure above, browse the Ghostbusters Clothing Gallery for more apparel like men's and women's clothes, kids shirts or hoodies.